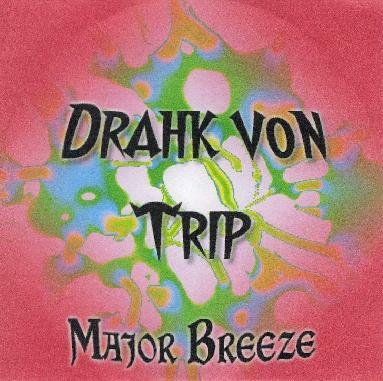 Drahk von Trip - "Major Breeze"
Drahk von Trip have released their latest psychedelic trip into the unknown in the form of this CD-R, that features two long jams from the rehearsal room recorded on May 21st, 2006. The opening track, Love Breeze, is 21 minutes long and a slowly building piece. The sound is quite good on this rehearsal room recording made with two microphones. Think of CAN with a female voice and flute and violin, as the tracks here are long and repetitive but slowly build and captivate you. The guitars really make this piece. It would be great and add a cool psychedelic flavour if Susanne could have some delay or effects on her voice sometimes. I would love this. Not sure if the track got its name by the sexual or orgasmic nature of the building vocals at the end, or not??? Major Drahk is a long 46 ½ minute piece that is a long trip and quite dreamy at the beginning. At around 25 minutes Susanne becomes slightly possessed and growls back into the forefront to bring forth strange visions as the hypnotic music drifts on. Quite an amazing feeling is created as the jam gets very intense and Göran is pounding the drums. It lets off some steam and drifts back down. Great jam. Be patient and you will be rewarded. If you are fans of the bands monthly jams that they release on their web page, then check out this limited edition CD-R release available from the band. For more information you can visit the Drahk von Trip web site at: http://www.drahkvontrip.com.